How can you create a yard or property that’s light years ahead of others in your neighborhood? One major way is to make the space usable at night, which includes outdoor landscape lighting. Since many people work or play till long after the sun goes down, they often don’t have time to enjoy their backyard until the evening hours. Good lighting can bring Zen-like qualities to any setting, and your garden can be immediately transformed into usable space at night. You can rediscover the perimeter of your property, make it fun again when entertaining guests or customers for an event or party. A recent trend in outdoor landscape lighting is installing light-emitting diodes, or LEDs because they are extremely cost-effective and weather resistant. They are already used to light up car dashboards and laptops, so why aren’t you using them to light up your walkway, backyard, or commercial property? 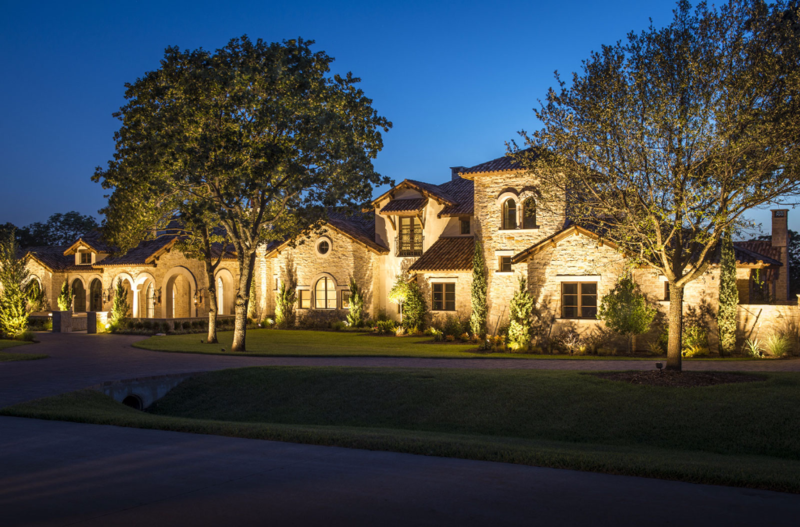 Low-voltage lighting is another recent trend in outdoor landscape lighting. Low-voltage lights can be used for down lighting or for lighting things above. Most homes use 120 volts of power, while low-voltage lighting uses about 12 volts, eliminating the need for deep trenches that hold the wiring. Low-voltage landscape lighting for the backyard needs only an outdoor receptacle and a transformer. A reflector light is meant to cast a lot of light, and they can be placed strategically around the property to absorb light in areas where too much would be a nuisance to those inhabiting the space. A big difference between LEDs and reflectors is in their energy usage; the reflector light uses a 35-watt lamp while the LED uses only one watt of energy, which can save a lot on your electric bill each month and last much longer than traditional lighting methods. Most LED lights are also programmable, which allows you to use different effects to enhance the space during an event or party. The easiest landscape lighting to place in the backyard is solar lighting. This type of lighting has no cords that need to be hidden, so you can add these almost anywhere in your yard or around your commercial property. They should be positioned in such a way so that the photovoltaic cell in the lighting fixtures receive enough light during the day to allow them to shine at night, so be sure to consult an expert on determining what the best locations are to have your outdoor landscape lighting installed. Create additional interesting in the evening landscape with artisan lights. They add whimsy and personality to the yard. Use them to light a pathway or illuminate a dining area. For drama and eye-catching appeal, install a spotlight to showcase a sparkling fountain. Small-sized spotlights abound, including the MR-11, the smallest spotlight available. There are even ones designed for underwater lighting. Bring lighting up into the air with brightly colored Chinese lanterns. Or, add a soft romantic ambiance with sheer globe lights. In order to hide light fixtures so they’re not noticeable day or night, you can pile rocks around the fixture. Before you invest in any landscape lighting, ask yourself what your purposes are for wanting illumination in your backyard. Perhaps you want to set a soft, romantic mood during the evening hours. Maybe you have a bench or a shadowy garden corner you need to illuminate for security reasons. A path leading through the garden may require landscape lighting to mark its boundaries. You might want to highlight some features of your backyard like a water fountain or pond.